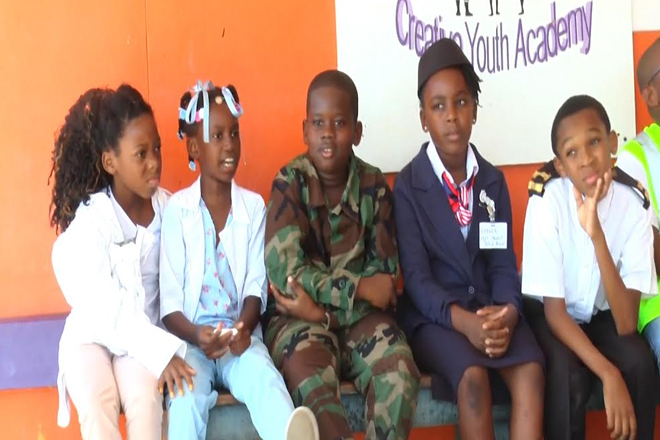 (ZIZ News) — As part of Spirit Week activities, The George Moody Stuart School hosted a Career Day on Wednesday. A number of students were seen decked out to showcase multi-coloured outfits depicting a variety of professions, as part of their “Spirit Week” celebrations. ZIZ spoke with Deputy Principal Of The George Moody Stuart school, Jillian Archibald who gave a brief run through of the activities held during “Spirit Week’ thus far. She also explained that the career day is dubbed “Wannabe Wednesday”. “For the entire week the children will dress in different clothing. Monday we had “Moody Monday” where the children came to school based on their moods. When they woke up in the morning, whatever mood they felt is what they wore. Some came as dancers and some came in their pyjamas because they were still feeling sleepy. Yesterday was “Tacky Tuesday” where they mixed and matched colours like prints, flowers and dots etc. Today is Career day because it’s called “Wanna Be Wednesday” and it’s basically allowing children to dress as the career they would aspire to be when they grow up”, Archibald said. Deputy Principal Archibald also explained what influenced the spirit week initiative. “I thought of it because I wanted to find a way to boost the children because having to move from our location at a short notice, it seemed as if some of the children were not feeling it and so we wanted to just incorporate some school spirit with a little bit of fun and excitement and I think it has been going very well”, the Deputy Principal added. A few students also told ZIZ about their career aspirations, namely Doctors, Lawyers, Nail Technicians, Firefighters, Police Officers, Architects, Veterinarians, Teachers and many others. Spirit Week has been added to the school’s calendar as a fundraiser to construct a new building as teachers and students are being temporarily housed at the St. Johnson’s Community centre. On “Throwback Thursday” the students will be wearing costumes or outfits inspired by fashions from the 60’s to 80’s. The Spirit Week of activities will wrap with a “Freaky Friday”, where students will wear coloured wigs, face paintings and eccentric outfits, all in efforts to lift school spirit and showcase creative and positive energy.